Once considered solely the domain of hot summer weather, winter florals are once again heating up the runways this season. Whether you’re attending a special event or simply looking to brighten your office, beautiful blossoms are perfect for bringing your Winter 2018 fashion to life. If you want to truly master this trend, look no further than the colourful and eye-catching examples spotted at Gucci, Prada and Balenciaga. 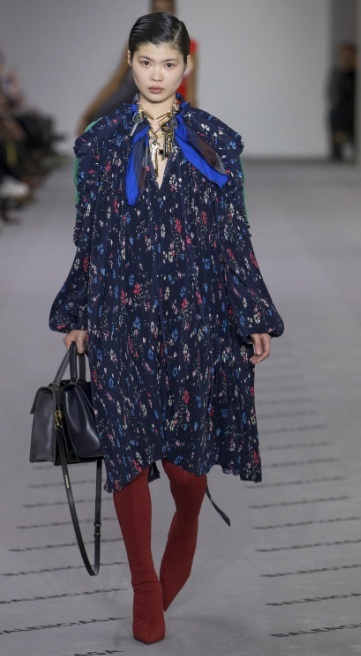 We are liking this luxury take on wintertime garden inspired prints, as spotted on the catwalk at the iconic Italian fashion house. This intricate frock makes a statement with its lace bodice, statement bell sleeves and multicoloured tulips. For a finishing touch, the embellished booties play up the attention-stealing pattern and prove that a wintry floral look doesn’t need to be drab or dreary. Try slipping into a pastel wool coat emblazoned with soft flowers, as spotted at Prada. Layered over a patterned and fringed frock, the textured topper truly creates a look of its own. Meanwhile, the watercolour shades downplay the thicker fabrics, and help to inject spring colours into your style. At Balenciaga, the look was demure, ladylike and perfectly business-appropriate for the fashionista who needs to stay stylish from nine to five and beyond. A pleated bohemian style dress made an entrance in a shade of navy blue, with tiny florals and puffed long sleeves. The addition of thigh-high boots in a burgundy shade brought contrasting colour to the outfit and pulled everything together effortlessly.